“I don’t know what to call my music,” Valerie said, but the problem isn’t a lack of descriptors for what this talented young woman plays — folk, blues, country, and Americana have all been suggested — but each only captures a part of what Valerie does. Gospel also thoroughly influenced Valerie’s music. During her main set, she played “This World’s Not to Me,” her favorite gospel song. She described hoping to hear it every week in week in church and feeling like the luckiest girl when it was always played. For the song of her of her encore, Valerie performed “You’ve Got to Walk That Lonesome Valley” on vocals with just a woman shaking a tambourine and the audience clapping along for accompaniment. Valerie delighted with the crowd with her hair’s origin story, which had a local connection. At 14, her parents sent her here to the District for an internship with her aunt and uncle. One day, in Union Station, she spied someone with epic dreads, and fell absolutely in love. Her uncle was horrified at the hairstyle, telling her she couldn’t do that — after all, didn’t she want a job? No, I want to be an artist! Her aunt was even more horrified that she was sending her niece home in “worse shape” than she got her. On top of all else, Valerie June was highly mystical. She spoke of collecting clovers in journals and faerylands. Her last song of the her set, “Astral Plane,” was about just that — the astral plane, and it was every bit as spooky and ethereal and magical as you might imagine. Notably, she played it on the fly, when her guitar “sounded weird” to her. Following her first, critically acclaimed album, Pushin’ Against A Stone (2013), Valerie received a nomination for Emerging Act of the Year at the 2014 Americana Music Association Awards. That packed field also included Sturgill Simpson, who has leapt to megastardom, vaulting over award winner Parker Millsap. 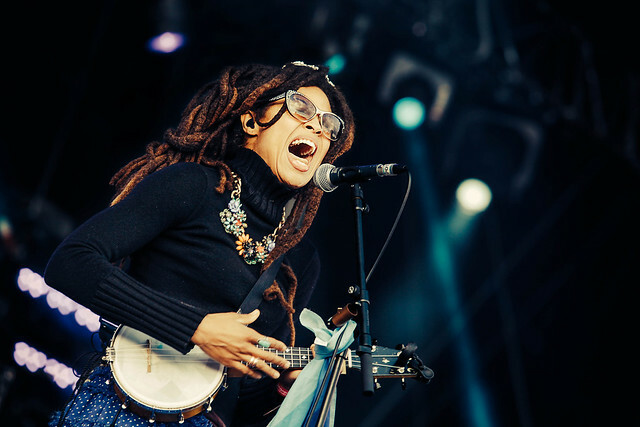 In 2017, Valerie June released The Order of Time to even more critical acclaim; the album sits at 89 — roughly the equivalent of 4.5 stars — on Metacritic. Valerie June’s work so far has consistently been of the highest level, and her fans can’t wait for her to produce more.